TLDR: Bluebird skiing early in the week will give way to more powder on Wednesday and Thursday before another weaker system arrives Friday. Yes, Solitude, we’ll take more powder, and agreed this week will bring those glorious goods to Utah resorts. Once again, we are looking at a tame start to the week followed by a multi-day bombardment of precip. Using these forecasts, we can note three things: First, a period of weak flow (loose height gradients) and few disturbances lasts over northern Utah until Tuesday evening. Second, a shortwave trough (decreased heights and increased vorticity) passes overhead from our southwest Wednesday morning. Third, a trough inlaid with shortwaves pivots across the far southwestern US on Friday. Firstly, the period of weak flow in the GFS forecast should mean relatively calm and clear conditions at resorts. Furthermore, Monday and Tuesday are very confidently off the table in forecast ensembles (e.g., GEFS) when it comes to new snow. My suggestion is that the early-week runs will be under blue skies. Cloud cover can possibly become more diffuse closer to Wednesday as the next disturbance and increased moisture approaches. However, I’m willing to bet both Monday and Tuesday will ski pretty blue when the sun’s out. 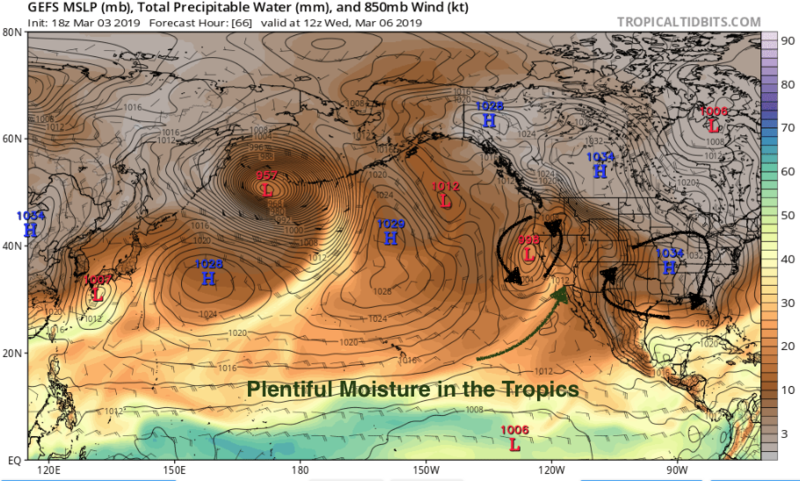 AR events typically don’t hit the hardest in the interior US because high mountain ranges block much of the moisture along its way into the US. For example, you can thank the Sierras for rain-shadowing much of the Great Basin in Nevada during AR events. However, an AR that tracks through the southwest can shoot pretty far and relatively unobstructed, as is the case Wednesday. The taste of moisture, along with plenty of available uplift, will be enough to dump a load of powder Wednesday in the Wasatch. 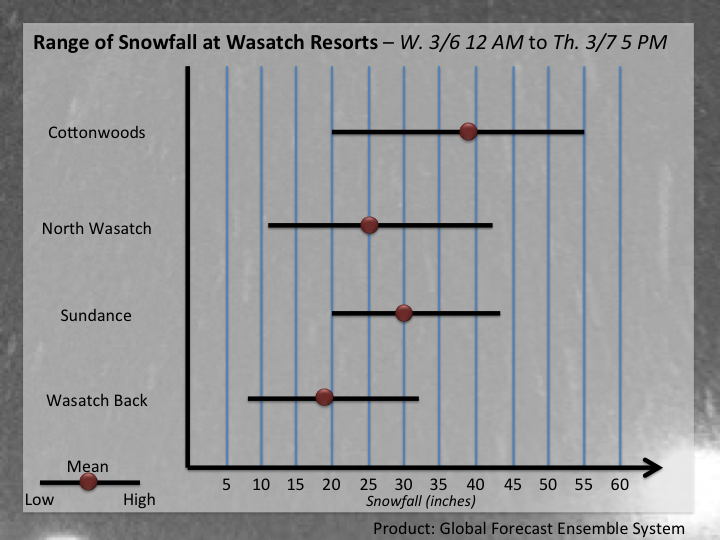 Given that we’re three days away, I think it’s appropriate to release an initial snowfall forecast for Wasatch resorts. At this point, the range of possibilities is more important than the mean, or than any single estimate. Ranges of possibility for total snowfall between 12 AM Wednesday through 5 PM Thursday in the Wasatch (subjective forecast, based primarily on the GEFS). Finally, another disturbance will impact resorts on Friday and Saturday. Substantial uncertainty exists in the forecast’s details, but this event will likely be different from Wednesday’s storm. Friday’s system seems notably weaker and a tad warmer. We’ll be monitoring the forecasts and trends in the forecasts, so check back this week for more details on this storm. Until then, enjoy the early week ski. Should be another great couple of bluebird days.